In the early 1960s, after seventy years on the sideline, the legendary football coach Amos Alonzo Stagg had retired and was living in Stockton, California. At the small home he shared with his wife, Stella, not far from the campus of the College of the Pacific, Stagg lavished care on the grass of his front lawn. Despite his efforts, the ground cover was sparse. One day a neighbor stopped by and told the coach that in the mornings, when he was away from the house, the neighborhood children were using his lawn for their football field. “You’ll never raise grass that way,” the neighbor said. White was wearing a pair of slacks, a long sleeve shirt and black shoes so shiny he could use them for a mirror if he needed to comb his hair, and he remembers when coaches wore coats and ties on the sidelines in the manner of Tom Landry, but those time have passed and aren’t likely to return soon. Nevertheless, White understands that a lot of little things add up when you want to build a sense of pride in your kids. “Bob [Brown] made them dress right. He was kind of old school. When we first got here, we had to wear a coat and tie to the game. 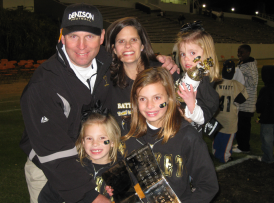 He set up good expectations.” One of White’s expectations for his kids goes to the heart of why he is a coach. “I tell them, ‘I don’t really care about the score. I want to win, I’m super competitive, but really, I want them to be the best that they can be, on the field and in the classroom. “If you let yourself be defined by the scoreboard, you’re missing the boat. When Texas won the National Championship in 2005, Coach [Mack] Brown told the kids after the game, ‘Don’t let this be the best thing that ever happens in your life. “We’re fortunate in Denison in having great teachers and principals who are exceptional about holding the kids accountable and letting us address problems. They know that if one of our kids messes up in the classroom they can email me, and I or one of my coaches will take care of it. If an athlete gets in trouble, he has to be held to a higher road. “If Jordan Taylor [The Yellow Jacket quarterback, who does not get in trouble] gets in trouble, it’s not just Jordan Taylor, it’s Denison quarterback Jordan Taylor. These kids represent me, they represent my coaching staff, they represent this school, this town, and all those guys in the locker room. If a kid does something stupid, and let’s face it, our kids are going to do some stupid things, it reflects on all of us. It’s a blessing to be a part of the team, but at the same time it’s also a responsibility. “Denison is a tough town. It’s a blue collar town. It’s not rich, and many of our kids come from broken homes, and a lot of them are just getting by. It’s tough. I understand that. They need to have something they can be proud of. ‘Jacket Pride’ or ‘It’s great to be a Jacket’ needs to be important to these kids. All our sports have to be like that. “I tell the upcoming freshmen in the off season, ‘This is what you’ve inherited. It’s a great place, but you haven’t done anything to build this—the kids and coaches who came before you built it for you. You are blessed to be here. You could be at some new school in Dallas with no tradition, but you’re in Denison.’ As rough and tough as Denison is, there are some great things about this place, and I want them to know that, to take pride in that. “I was born in Bryan, Texas,” said White. “My dad was a Department of Public Safety trooper, so we moved around a bit. When he decided he wanted to go a different direction in his life, we moved to Branson, Missouri, and he worked for Silver Dollar City. White’s parents divorced when Cody was a senior in high school, and both moved back to Texas. White, who had played football— he was linebacker and offensive lineman— for the Branson Pirates, finished his senior year, graduating in 1987, and headed back to Texas to enroll at Southwest Texas State—it’s Texas State now—where he continued his football career with the Bobcats. In June, when White and his wife Lori, returned from a short vacation prior to packing for the move to Duncanville, he got a call from Coach Smith. Smith was a Scot, not the kind who wears a kilt, but a Highland Park Scot. He had graduated from the Dallas high school whose football program has spawned Texas gridiron legends Bobby Layne and Doak Walker, and now he was going back to his alma mater as the head coach and athletic director. When Smith took over at Highland Park, several members of the old staff resigned and White stepped in to fill a slot. “To tell the truth, I was no way ready to coach at that level,” he said. “I learned on the fly. There are no classes in college to learn to coach football. You learn on the job from studying the game and from being with the right people. There are guys who work awfully hard at it and guys that don’t. Like any other job in America, there are guys who are good at it and guys who aren’t. The White family still numbered only two when they moved to Dallas, so they rented a duplex near the school. 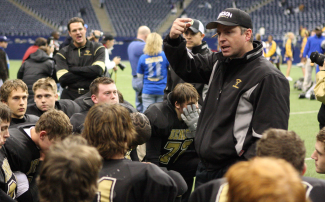 “I could throw a rock into the stadium, and I could walk to work every day.” In White’s first year at Highland Park, the Scotties went to the 4A semi-finals, where they lost to Denison. The young dream big dreams. The novice lawyer nervously waiting to make his first opening statement to a jury may well imagine himself one day appearing before the Supreme Court or perhaps even sitting on the high bench as a justice. The actress with a bit part in an indie movie may fall asleep at night rehearsing the speech she will deliver from the platform when she receives her Oscar. So may the young football coach, as he stands on the sidelines watching his junior high charges scrimmage before a thin crowd of proud parents, look up and see in his future a sea of burnt orange in Memorial Stadium in Austin or hear the roar of the crowd that greets the Dallas Cowboys. Indeed, the young dream big dreams, and Cody White was no exception. “There was a time when I thought I might want to coach in college. I had an opportunity when Scott went to Baylor. You’ve got to start as a graduate assistant just like in high school, where you start as a freshman coach. I thought about it, and looked at what those guys do, and the time spent away from family—at that time we had our first little girl. I just don’t think it’s that conducive to a family life. No one wants it to be that way, but it usually is. The Montgomery Bears were in a world of hurt. The 4A school in an historic old Texas town—Montgomery bills itself as the birthplace of the Texas Lone Star flag—had lost twenty straight games when Clifford and White arrived. It did not get any better in a hurry. “We coached our tails off and went 0-10,” said White. “It was an interesting experience, but it was miserable. We were everybody’s homecoming opponent. We were used to winning twelve or thirteen games a year at Highland Park, so it was very frustrating. It was a humbling experience. “The next year we went 3-7, and I’ll still tell anyone who will ask that it probably was the most rewarding season I’ve ever had, including this last one. 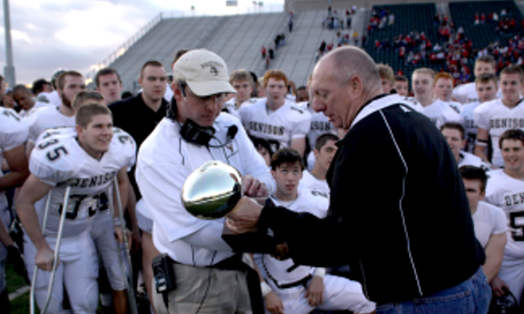 (In 2009, White’s Denison Yellow Jackets went 13-2, losing to Aledo in the state semifinals.) We broke the losing streak and beat Navasota for the first time in years. We worked hard, but we could see the kids learning how to win.” But White wouldn’t be around for the Bears’ next season. Denison was calling. Scott Smith recruited North Texas for Baylor. He had been in Denison talking with Coach Bob Brown after the 2000 season and found out Brown was looking for a coordinator. Smith suggested White. Highland Park II also lasted only a year. 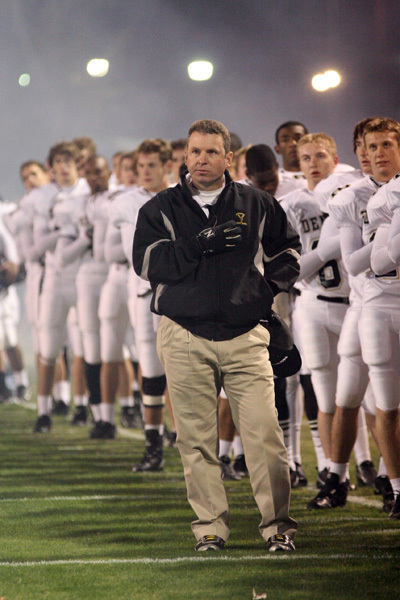 Scott Smith had left Baylor and the college game for six-time state champion Odessa Permian and one of the most intensive football programs in Texas prep sports. Smith wanted White as an offensive coordinator, and White wanted to work for his friend and mentor again. And it was Odessa Permian, for goodness sakes. Hanging over White’s two years at Permian was the specter of Friday Night Lights, the bestselling book based on Permian’s 1988 season. Hollywood came to town for the 2003 football season to turn the book into a movie, put the town, the school and the football team into the spotlight. White went to Coach Brown to talk things over. “I said, ‘I’ve got the offer, and this is what it will pay. But the reality of Texas football is that if I leave here and take this job, I won’t come back here as a head coach. I could win ten state championships and it won’t count in Texas.’ ” It was a difficult choice, but one that did not have to be made. 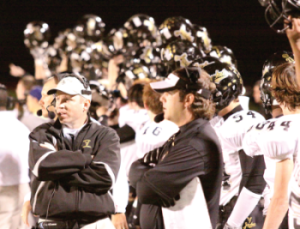 Bob Brown decided to finish his contract as the athletic director and turn the head football coaching duties over to White, and when the referee started the clock of the opening game of the 2007 season, Cody White was the man in charge on the sidelines. “It was a good decision,” he said. “Lori and the kids are happy here, and I give a lot of credit to Dr. Scott and the school board for working things out. It took a little bit of faith in me for them to do that. White’s first season as a head coach required some adjustments to the new role and its responsibilities. “I made a lot of mistakes, and we had a team of mostly freshmen and sophomores. We were 4-6, but we came from 18 points down to beat Sherman, and that’s important here.” So far, White is 3-0 in the annual Battle of the Axe, the second or third oldest high school football rivalry in Texas. White’s second team, led by junior running back sensation D. J. Jones, won twelve straight before being knocked off in the regionals by the eventual state champs from Sulphur Springs. Last season, with Jones back for his senior year, the Yellow Jackets won the district and reached the semi-finals before losing. There is an often-quoted maxim in football: “There are two kinds of coaches, those who have been fired, and those who will be fired.” So far Cody White’s coaching career, both as an assistant and in his three-year tenure as a head coach, has been pretty smooth sailing. He has suffered through only three losing seasons, two at Montgomery and his second and last year at Odessa Permian. Still, there have been disappointments. “Even though it ended up bringing me to Denison, I’ll always be disappointed that we knew how to fi x things at Permian, but we just didn’t get the time. I think they were unrealistic, and that’s a frustration. 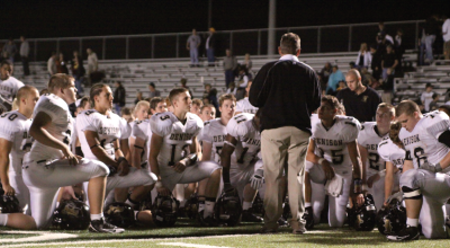 On the second week of the season, Denison went on the road and was upset by Big Springs. “They were a good team, but they weren’t within 21 points of us. On the bus coming back to Denison, I talked with Scott [Smith] and told him that when we get off this bus at five in the morning, we’re going to the weight room, and I’m going to rip their tails. I was mad. At Denison’s level of competition, the head football coach operates more in the style of a corporate CEO than of an old-fashioned down-in-the-trenches coach of the past. 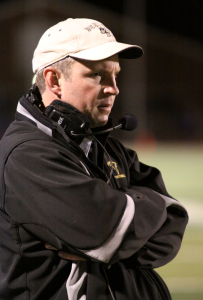 He manages the talents of his staff and his players, and in the case of Cody White, who is also Denison’s athletic director, he watches over all the other sports as well. At the varsity level White relies on his assistants, particularly the coordinators, to look after the myriad details that have come to dominate the cerebral side of football. “In some systems, particularly in college, the head coach just walks around, but I coach a position. I coach the quarterbacks, and I’ll always do that. The first year, even though I had brought Eddie Hancock in as offensive coordinator, I called the offense. I wanted him to learn it, and I knew we were going to struggle a little bit, and I didn’t want anybody but me to get the blame for bad play calls. I didn’t do a great job, but we did OK, but as soon as that season was over, I turned it over to Eddie. I thought we’d have a better offense, and I’d be a better head coach if I didn’t focus so much on just the offense. Cody White sees so much more in his “calling” than just what happens on the field. He comes from a strongly religious background and is not afraid to let that influence how he goes about his job. It is not easy in a society where there are scores of naysayers waiting to be “outraged” by almost anything in the public domain that smacks of faith. “I should know better than to say that because I sometimes accuse my wife of using ‘always’ and ‘never’ way too often. Things change, but I don’t see myself ever wanting to coach in one of those huge 5A, multi-school district schools. I don’t want to say never, because you never know. There’ll be some opportunities if I want to go somewhere else, but I’m very happy here, my wife and family are happy here. Dr. Scott and the school people have been very good to me. Do you have a great story to tell about Coach Cody White? Share it with our readers. 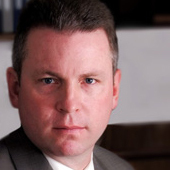 Kent Black was the first CEO of the United Space Alliance, a joint venture between Rockwell International and Lockheed Martin formed in 1996 at the behest of NASA to consolidate Space Shuttle programs under one prime contractor. Not bad for a farm boy from Illinois with a yen for electronics. Texas Nursery & Floral Co. Most folks don’t give much thought to the trees, bushes, shrubs and plants that grow all around them. They are part of the landscape and are just there. But in an urban environment, what grows there was usually planted there by someone for some specific purpose, and the seed or the cutting that they planted came from a nursery.